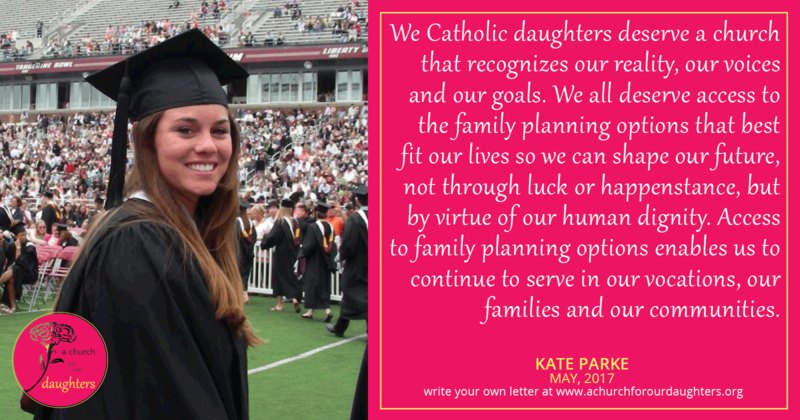 Kate Parke is Domestic Associate for Catholics for Choice, coordinating the organization’s domestic activities within the states and DC by informing and strengthening pro-choice policy with Catholics, policymakers, advocates and collegial organizations. The views expressed in this letter are her own. When I was 18, I was beginning a new chapter of my life at a prestigious university. I was hungry for knowledge, and the Jesuit institution I decided to attend held promises of enlightenment, inspiration and fulfillment. As eager as I was for the new opportunities to come, I also reflected on the many unknowns that I would soon encounter in college. I didn’t know if I would like my roommate. I didn’t know if I would get homesick or want to switch my major. Eventually, these doubts cleared up—my roommate is still my best friend, but my first major didn’t last longer than a week. I was empowered through education to explore any and all prospects, ultimately continuing on to earn a law degree. My options were boundless, however, because of something that I did know for sure: I had no intention of starting a family while earning my degrees. Luckily I had the resources to make healthcare decisions that would allow me to realize my educational plans, but I can’t say the same for all of my peers. My ability to access the family planning method of my choice was not granted through my Catholic educational institution; I was just fortunate to have the means to access these services elsewhere. Family planning can encompass many elements, but it should never include the imposition of the Catholic hierarchy’s opinion on your decision whether or when to have a child. Unfortunately, that is the current reality for women in this country and in our church. For decades—despite a birth control commission convened during the time of the Second Vatican Council overwhelmingly voting to support access to modern contraception—the Church hierarchy has ignored the needs of everyday Catholics. Its restrictions on the use of birth control, combined with the bishops’ advocacy to enact them into public law, affects Catholics and non-Catholics alike. In the past few years, and even within the past few weeks, we have seen access to contraception obstructed by those claiming religious liberty for corporations and other institutions, ignoring individual rights. Under the Obama administration, the Affordable Care Act required that most employers include birth control in their employee health insurance at no cost to the woman. While churches and houses of worship were originally exempt from this contraceptive requirement, the United States Catholic Conference of Bishops (USCCB) pushed further. The federal government responded to the USCCB’s demands with an accommodation for religious nonprofit employers with objections, like some Catholic universities or Catholic hospitals. Later, the US Supreme Court granted some for-profit companies, like Hobby Lobby, the same right to refuse if there was a religious objection. Now, at the behest of the USCCB and ultraconservative allies, the Trump administration is poised to allow all corporations and institutions, and some individuals, to refuse birth control coverage to employees and dependents based on any moral or religious objection. Lost in this years-long policy debate were our voices—the voice of the sophomore attending a Catholic university, the nurse working for a Catholic hospital, or the cashier at the local craft store that claims to “operate the company in a manner consistent with Biblical principles.”i We have not been heard on these matters, and so this letter is to you my friends, cousins, nieces and fellow daughters. When the bishops lobbied to expand the contraceptive coverage exemption, they left women’s voices out. As one of the 99 percent of Catholic women who have used modern contraceptives, and as a former student at a Catholic university, I know the bishops do not represent our views on family planning or our needs in society. I believe I have the same right to forge my own destiny as any man in this world, and access to contraception is a vital part of my ability to do so. Choosing the family planning option that was best for my life and my circumstances enabled me to succeed and, I would argue, to be more faithful to my calling as an attorney, a friend, a daughter. Not everyone will be as fortunate as I was. As a student, you may be forced to compromise on your educational goals. As an employee, you may be denied the ability to adequately space your children’s births. The bishops have the government’s ear on their version of religious liberty, and they seem intent on using that channel to impose their beliefs on everyone, hurting most those who don’t have access to other options. Workers and poor women bear the brunt of their influence, while the needs, beliefs and consciences of women in the Catholic church continue to be ignored. Fellow and future daughters, we deserve better. We Catholic daughters deserve a church that recognizes our reality, our voices and our goals. We all deserve access to the family planning options that best fit our lives so we can shape our future, not through luck or happenstance, but by virtue of our human dignity. Access to family planning options enables us to continue to serve in our vocations, our families and our communities. I write this letter to tell you there is a place for us and our families in this church. We are the majority of Catholics that support access to modern family planning options within our church teachings. We reflect the 99 percent of Catholic women who use and seek these critical healthcare services. Catholics for Choice continues to fight for all individuals to plan their families according to their own lives and circumstances, and I encourage you to join that fight. Do it for all our daughters.